I bought the SD03 because of the distinct styling but it was more hefty than I thought, considerably larger than a Thorfire VG10 which has the same reflector size and is already not the smallest in its class. Weight w/o battery 183 gram, (130 gram for the Thorfire). 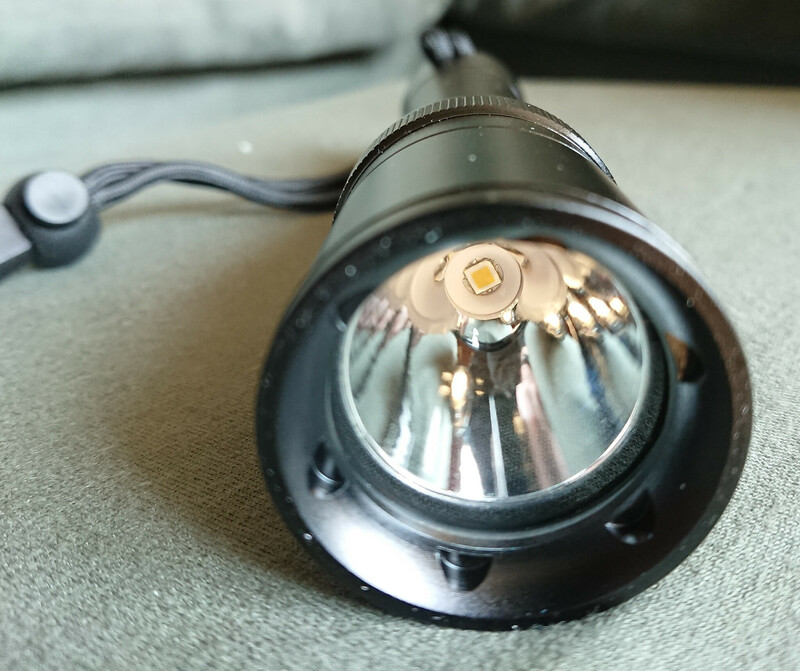 It houses a cool white XM-L2 led which on the brightest setting puts out 800 lumens (on a 3100mAh protected Keeppower that was not completely topped up), medium is 350 lumen, low is 80 lumen. UI is simple and easy to use, a magnetic ring with a ball bearing that locks in discrete positions selects off, low, med, high, off, repeat. The ring can fully rotate so from off you can select low to the left and high to the right. The ring rotates fairly easy and I could operate it well with thick gloves on, but there is no lock-out possible other than removing the battery. 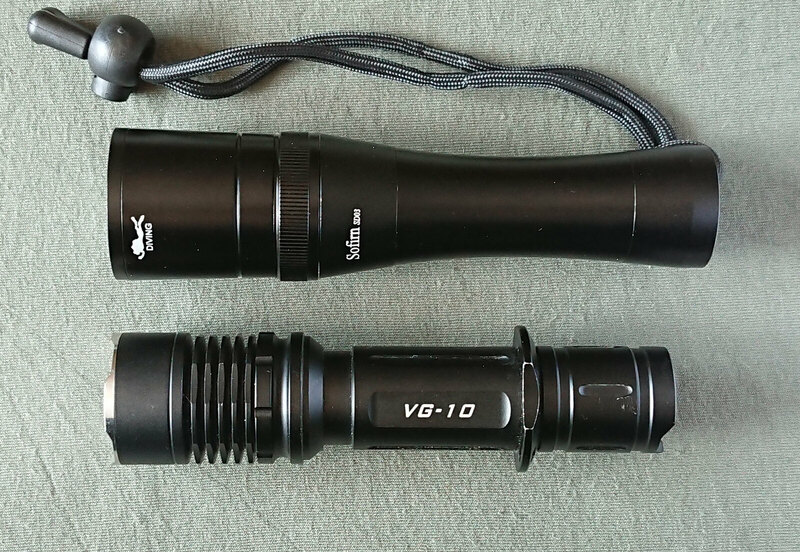 The SD03 can open in 4 positions along the flashlight (picture shows 3 of them), I would think that could be less, any opening is an extra option for water to get in. At least all positions are protected well, with generous threading and double o-rings that are well-lubed (no lube came with the light btw, for re-lubing I used some that came with an Archon dive light). The head can open just above the magnetic ring and also at the bezel. The glass window is huge and is firmly pressed by the bezel onto the lubed o-ring. The led is on a 20mm aluminium non-DTP star, which is fine at this output. You can see in the pic that I already swapped it for a sliced LH351D (the famous 5000K 90CRI dogfart led) on a DTP copper board, the reflector was reamed to 9 mm to fit a different centering piece. To my dismay I dropped the freshly lubed o-ring into the reflector so that had to be cleaned completely (water, soap, soft tissue etc. ), it looks good again but will never be as pristine as before. The new led is a bit throwier than the stock XM-L2 and the spill is a bit ringy, but I doubt it will really annoy anyone in use. I measure 700 lumen on highest setting (not much worse than stock ), CCT 4500-4600K, depending on brightness, and not much different in the spill. CRI is around 91 with R9=50, tint is on top of the BBL or slightly below. I should remove and show you the driver, but that looks quite a challenge (it is behind a plastic disc that looks like it will break upon removal) so I will give it first to a collegue of mine who will check its use under water. She dives down to 25 meter so the light will not be tested to its max, but I hope she can give an impression of usefulness. Preliminary conclusion: The SD03 seems good quality, I could not find obvious faults. The magnetic ring is an attractive and convenient feature. As a non-diver I can not help thinking that the SD03 could be built less plump, with preservation of function and performance, but the size and heft may as well be a quality under water. Gotta say, that’s one nice chunk o’ glass! Looks like an all-around nice light, but yeah, I’ve got concerns about how many threaded junctions it has. 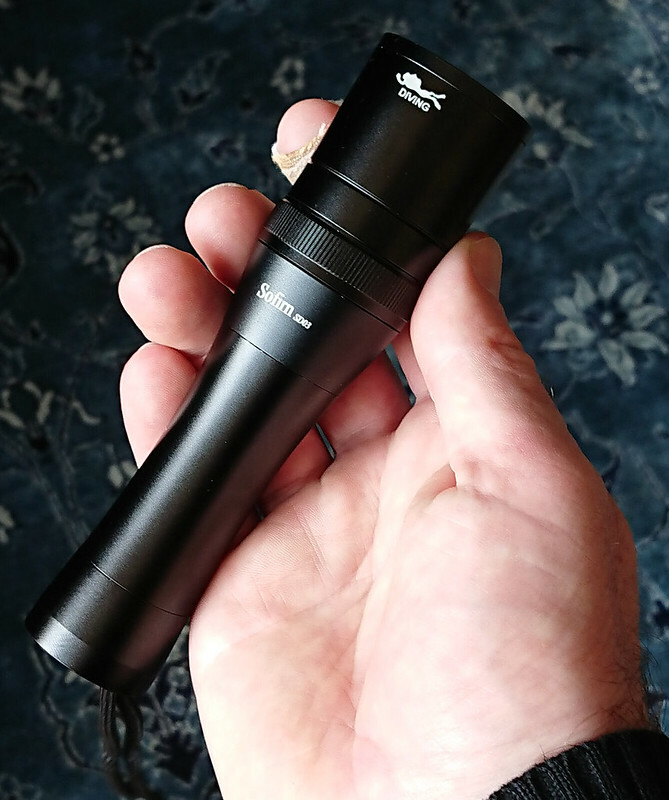 My “ideal” diving light (not that I go diving…) would be to have the front glass press-fit from behind into an S2+ type bezel/head, held in place by the reflector and LED/driver pill, then screwed onto a 1-piece battery tube like on an AAA twisty. This way, only 1 threaded junction (all O-ringed out the bazoo), and of course the glass-to-bezel junction. Still, that’s a nice looking light! Dunno why the almost universal fascination with CW for use underwater, though, when most of it would just backscatter right into your face, vs a nice WW that would penetrate murky water a lot better. Don’t know either, cool white sounds bad under water. At least on land the tint has improved immensely with the new led. Unfortunately can’t upload to Imgur as more than 30 sec. Seems the yellows then the reds are absorbed. Cool whites would have bluer predisposition and better rendering. Nice video! But it is food for thought though. You could argue that to penetrate water best and see far away, you need cool light, or you could argue in order to see colour contrast best you best start with lots of red, so you need warm light. I don’t know of the validity of the video, but it was threaded that the pink may be a ‘neon’ colored marker cap (which btw are Crayola).